For Abalos' son (also a politician) see, see Benjamin Abalos, Jr. This name uses Philippine naming customs. The first or maternal family name is Santos and the second or paternal family name is Abalos. Benjamin Santos Abalos, Sr. (born September 21, 1935 in Pangasinan) is a Filipino politician who served as a former chairman of the Commission on Elections. He was also a former chairman of the MMDA and mayor of Mandaluyong City. He is the father of current Mandaluyong City Mayor Benjamin "Benhur" Abalos, Jr..
Abalos was born into a poor family in Pangasinan on September 21, 1935. He studied Economics at Ateneo De Manila University and graduated from the Manuel L. Quezon University (MLQU) in 1957. Abalos supported himself through college by taking several jobs, working as a janitor, factory worker, and a caddy at the Wack Wack Golf and Country Club. In 1963 Abalos ran for vice mayor of Mandaluyong, which was then part of Rizal and lost to the scion of a political family. After his initial attempt to enter politics, Abalos served as a Trial Court Judge wherein he gained the distinction of being named as outstanding judge for 10 straight years. He ran for Mandaluyong mayor in 1980, losing to the candidate of former Philippine Dictator Ferdinand Marcos. In 1986, shortly after Marcos was ousted through a popular uprising, President Corazon Aquino appointed him as Officer-in-Charge (OIC) of the then municipality of Mandaluyong. As OIC of the town, he ran for the post of mayor and won in the local elections of 1988, the first local elections under the 1987 Constitution. He was re-elected three times in the elections of 1992, 1995, and 1998, making him one of the two Aquino OIC appointees who survived and secured the constitution-mandated three consecutive terms limit for local officials. Abalos was a former member of the Laban ng Demokratikong Pilipino (LDP) later joining the then newly formed Lakas NUCD-CMD. On January 20, 2001, Abalos was appointed chairman of the Metropolitan Manila Development Authority (MMDA), a post he held until the following year. On September 27, 2007, Iloilo Vice Governor Rolex Suplico filed a 64-page impeachment complaint against Commission on Elections chairman Benjamin Abalos, Sr. before the House of Representatives of the Philippines regarding the ZTE national broadband network (NBN) deal. It was endorsed by Representatives Teofisto Guingona III of Bukidnon and Teodoro Casiño of Bayan Muna (People First), and Zamboanga City Representative Ma. Isabelle Climaco. Affidavits from Romulo Neri and Jose de Venecia III supported the complaint. 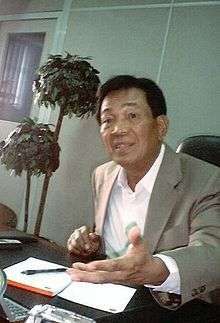 On October 1, 2007, Abalos resigned during a press conference. The Commission on Elections appointed Resurreccion Borra as Acting Chairman. He is married to Corazon de Castro with whom he has 5 children including incumbent Mandaluyong City mayor Benjamin Abalos, Jr. more popularly known as Benhur.